More than 250 students and faculty members came together on Monday, Jan 18 to serve others in honor of the legacy left by Dr. Martin Luther King, Jr. at ASU’s 17th annual MLK Challenge. 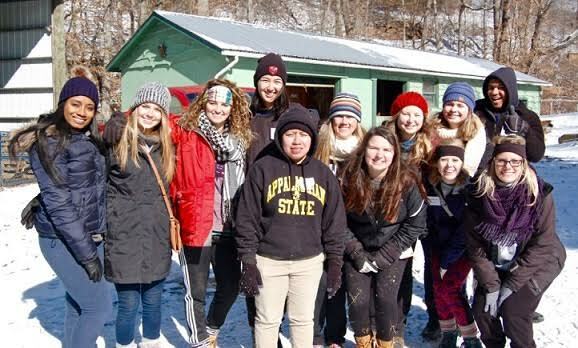 App State students work together to service the community during the 2016 MLK Challenge on Jan. 18. The annual challenge was led by Appalachian and the Community Together, also known as ACT. Along with participating students and faculty, the campus-based organization partnered with Wingate University and The University Highlands to support 20 community partners. Despite the recent onset of winter, the 9-degree weather and 30 mph winds didn’t slow them down. Those students and faculty, along with some students from Wingate University, signed up with ACT, Appalachian and the Community Together, who partnered with University Highlands, to help out 20 community partners in nine degree weather and 30 mph winds. Service Advisor Daniel Burwell was one of six undergraduate students and one graduate assistant who helped plan the event, which was run entirely by students. Students were separated into 12 groups, each one led by a student leader and various faculty members. Several local restaurants and businesses supplied food and donated to the Hunger and Health coalition, respectively. Pat Beane, an honorary ASU bachelor’s degree recipient by the university, was the guest speaker for the event and challenged students to think critically about community service. The event aimed to focus not only on Dr. King’s legacy of service, but other aspects of his career, as well, including activism. Part of the appeal of the event is in the challenge itself. Students showed up Monday morning with no knowledge of the work they would do that day, when their roles were randomly assigned to them. “Students got to learn about MLK and the injustices he stood for,” Burwell said. “It’s all a part of the challenge” was the mantra for the day, according to ACT Assistant Director of Community Service Thomas Evans. They even had to overcome little challenges, like the work van that didn’t start that morning. Burwell said he is proud of the students who participated in the challenge, and many were inspired to take on new service projects. What’s next for ACT?The next event for ACT is Dance Marathon, which will support Parent to Parent and the Western Youth Network. Want to get involved, join the ACT OUT club or participate in an alternative service program? Stop by the ACT office on the first floor of the Plemmons Student Union, near Sanford Hall. For more information, visit act.appstate.edu, where you can find a link to the volunteer data base. Students can plan small scale service events and projects, which are impactful and beneficial to the community.